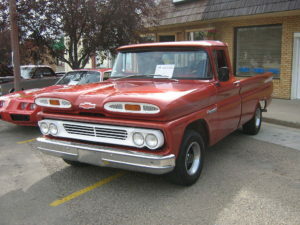 The classic lines of the Chevrolet Apache truck were available on Chevy trucks from 1955 through 1959, though, according to one source, the two years the name Apache was assigned to the body style were 1958 and 1959. 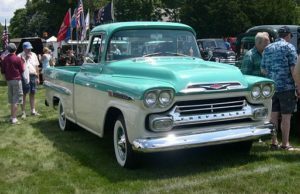 According to Truck Trend Network, all ’58 Chevy trucks were created as part of the Apache line, which was redesigned for ’58 with dual headlights, a redesigned grill – it was also the first year the fleetside style of bed was offered. The 1958 Apache came with a 283 CID (cubic inch displacement) V8 that provided 160 HP, notes ConceptCarz – though a six-cylinder option was available, too. The ’58’s transmission came in both a 3-speed manual and a 4-speed automatic. Sadly for fans of these old trucks, while a lot of ’58 Apaches rolled off the assembly line, and they were workhorses, not a lot of them survived the heavy farm use they were designed to provide. 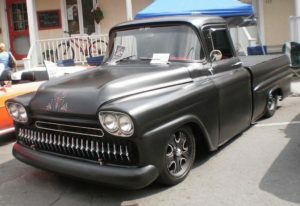 According to Old Ride, the ’59 Apache truck was released with five new color options and a new interior design, and featured the carry-over wrap-around windshield of the ’58 models. The ’59 also had a bigger, fancier hood ornament and restyled badges on the front fenders of the truck. The image below is a 1060 model I found labeled as an Apache.